My name is Mel and I collect antique dinnerware. I know, what am I doing on this website then, you might ask! Some of the dinnerware I collect has decals applied with Native Americans and I am researching them to learn more about their history. One of the plates features Chief Wets-It from the Assiniboine tribe. I have been able to find out very little history about him other than he was a delegate at the Trans-Mississippi and International Exposition of 1898. Here is a photograph of the plate (dates to the early 1900's). I have seen similar images from the Exposition, but haven't found any information. If someone could point me in the direction of some history of Chief Wets-It, I would appreciate it. Wets It aka He Wets It was a very prominent Assiniboin war leader. 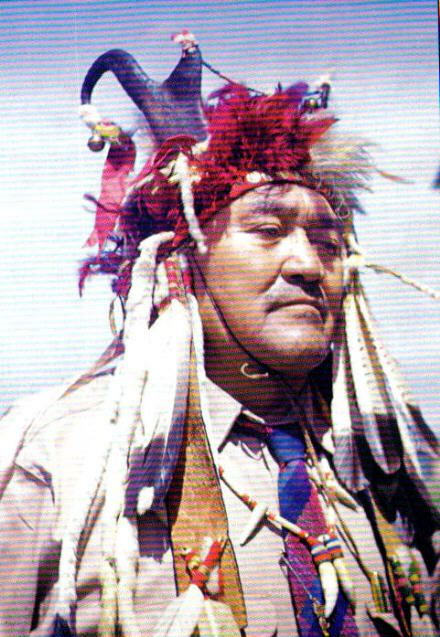 He was a full-blood Assiniboin, who settled at Fort Peck Reservation, Montana (which means he doesn´t exactly fit in the Canadian Tribes section). According to his stepson (Joshua Wetsit) he had an excellent war record. He was among the leaders of the Assiniboin delegation to Omaha Exposition. His son Joshua Wets It was an informant to J.C. Ewers, 1953. Thank you! I knew he wasn't Canadian, but didn't know where he might fit on the message board. I saw Assinboine and figured that was close. I very much appreciate your information. you´re right, the Assiniboines are not easy to categorize, living on both sides of the border. The Assiniboine name, First Boy, was given to me [J.L. Long] at the age of ten by He Wets It, a noted warrior and later, in his old age, a medicine man. He Wets It (Wahinkpa I Ax Ba) also known as He Wets His Arrow lived from 1855 to 1910. He married Katie Cambell Wetsit and had several children, among them Gertrude Wetsit Black Tail (later married to Chief Black Tail) and Joshua Wetsit (1887-1971, also known as Chief First to Fly), who later was an informant of John Ewers. Both of these children were with their parents at the 1898 Trans Mississippi Exposition in Omaha. 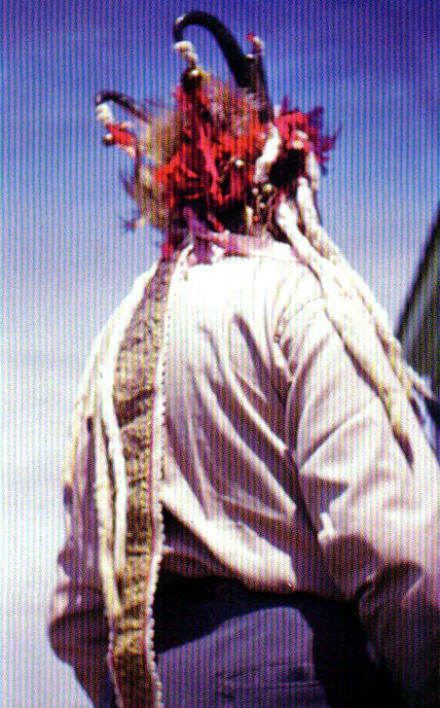 The Antelope Headdress He Wets It wears in the Rinehart photo above was actually a replacement of the original. Night Crawler, a nephew of him, borrowed the latter from him to go with a war-party who later ran into a Piegan hunting party. Night Crawler and several others were killed. The sacred bonnet was taken by the Piegans. In 1939 the Piegans gave the bonnet back to He Wets It´s descendants. A semilar story can be found in American Indian Art Magazine Autum 1982 page 45. From that article I scanned the photo's Dietmar just posted. Hi my name is Connie and I personally know some of Chief Wets His Arrow. I have their phone numbers & emails if you would like further information. If not mistaken he would have been their great grandfather and his son Joshua would be grandfather and father. This said Bonnet is now located in Valley County at the museum donated by his descendant-granddaughter. Chief actually has a descendant that resembles him alot-great grandson. We have the same picture with him wearing the Bonnet. I am a graduate student in Nebraska, and I am looking for anyone related to the family of the Wetsits in this photograph. Do you know any? I have a photo of Chief Wets-It hanging on my wall in my man cave. Don't know how to post it. you can send me (SchMoehring@t-online.de) a scan of the photo and I´ll post it for you. I'm late finding it, but this thread is awesome... nice to see the interest the Wetsits still inspire!!! I'm Randy, I am the great grandson of the author/interpreter mentioned above - James Larpenteur Long(First Boy)-Author of(The Assiniboines – From the Accounts of the Old Ones told to First Boy) I grew up on the rez in the shadow of Fort Peck Lake in Wolf Point Montana. George Denny and Phillippena Long(Denny) are my maternal Grandparents. Our house was right across the road from Laura Wetsits house, I never met her, but I guess she and my Grandmother were good friends for many years. We are a very diverse and resilient people(Assiniboines), having over the last century, blown to the wind and back again... I would like to thank everyone who has taken an interest in preserving our past, present and future! The man seated in the foreground, center left, is Wets It (aka Joshua He Wets It), a very prominent Assiniboin war leader wearing his famous headdress of antelope horns. Compare an 1898 portrait by F.A. Rinehart, National Anthropological Archives, Neg. No. gn_03719. Wets It holds a light-colored staff which has a human scalp attached near the top. 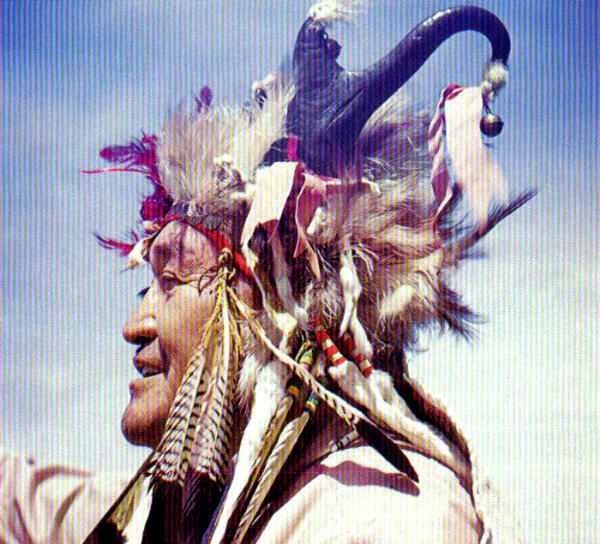 Behind him, another man wearing an eagle feather headdress holds a "crooked lance" wrapped with strips of otter fur, an emblem of one of the warrior societies. It is likely all of the men shown here belonged to the same organization, with their wives and children. Several other, fine headdresses are seen, including two with buffalo horns, and two painted war shields carried by men at the left..."
Is this Joshua or the father?